We offer both private and small group tours to Lantau Island. Lantau Island is often referred to as the ‘Lungs of Hong Kong’ because it is so green and underdeveloped. 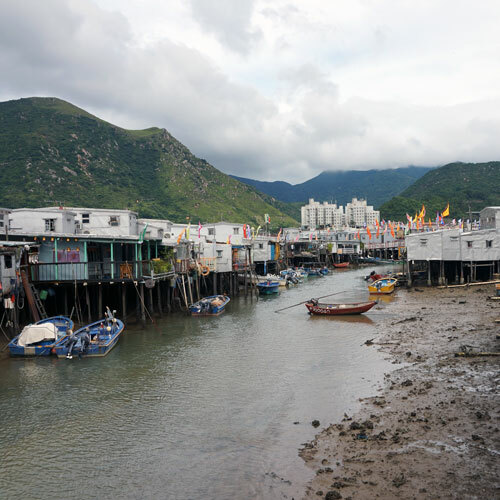 Take a tour of Lantau with us and visit the awe inspiring Big Buddha and the wonderfully quaint stilt village of Tai O. Both our private and public group tours include a ride on the Ngong Ping cable car and a boat ride at Tai O. Public group tours run on Tuesday, Thursday and Sunday. Private Lantau tours can be scheduled for any day of the week. A private 7 or 8-hour tour of Lantau Island. Visit the awe-inspiring Big Buddha, ride the Ngong Ping cable car and explore the wonderfully quaint stilt village of Tai O. A private tour gives you the benefit of being able to enjoy the tour at your own pace. It is 100% customisable and also allows for the option of adding on an additional hour which can be used to incorporate some extra sightseeing based on your interests or to have your guide meet you at your hotel rather than the prearranged meeting point. A 7-hour public group tour of Lantau Island. Visit the awe-inspiring Big Buddha ride the Ngong Ping cable car and explore the wonderfully quaint stilt village of Tai O. If you book a small group tour you will join a group of other visitors. We take a maximum of 9 guests on our group tours in Lantau so it is still an immersive experience with lots of one-on-one time per person with the guide. You will need to be comfortable talking to and sharing your space with a group of new friends.